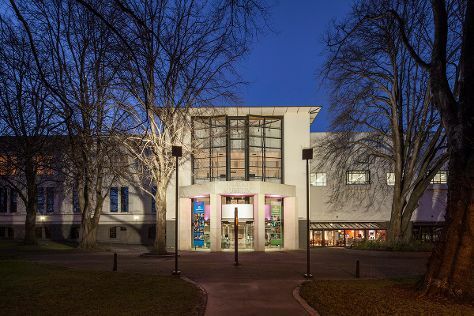 Start off your visit on the 25th (Sat): get engrossed in the history at Wellington Museum, then identify plant and animal life at Tonga Island Marine Reserve, then examine the collection at Cable Car Museum, and finally examine the collection at Museum of New Zealand (Te Papa Tongarewa). Get ready for a full day of sightseeing on the 26th (Sun): meet the residents at Wellington Zoo, then explore the activities along Oriental Bay, then admire the landmark architecture of Old St Paul's, and finally go from sight to sight with Wellington Cable Car. To find traveler tips, reviews, ratings, and other tourist information, use the Wellington travel route planner. Taipei, Taiwan to Wellington is an approximately 17.5-hour flight. Traveling from Taipei to Wellington, you'll lose 4 hours due to the time zone difference. In January, daily temperatures in Wellington can reach 24°C, while at night they dip to 17°C. Wrap up your sightseeing on the 26th (Sun) to allow time to travel to Rotorua. Visiting River Rafting & Tubing and Paradise Valley Springs Wildlife Park will get you outdoors. Discover out-of-the-way places like Orakei Korako Cave & Thermal Park and Waimangu Volcanic Valley. Step out of Rotorua with an excursion to Huka Falls tracks in Taupo--about 1h 20 min away. There's lots more to do: take in the natural beauty of Wai-O-Tapu Thermal Wonderland, get interesting insight from Tours, look for all kinds of wild species at Redwoods Treewalk, and take a pleasant ride with a tour on horseback. To see ratings, more things to do, other places to visit, and more tourist information, read our Rotorua trip itinerary builder tool . Traveling by flight from Wellington to Rotorua takes 3 hours. Alternatively, you can do a combination of flight and bus; or drive. In January, daily temperatures in Rotorua can reach 27°C, while at night they dip to 19°C. Wrap up your sightseeing on the 29th (Wed) to allow time to drive to Waitomo Caves. Kick off your visit on the 30th (Thu): admire the sheer force of Marokopa Falls Walk, Head underground at Waitomo Glowworm Caves, then explore the fascinating underground world of Caveworld, then explore the fascinating underground world of Ruakuri Cave, and finally trek along Ruakuri Walk. For ratings, other places to visit, maps, and other tourist information, you can read our Waitomo Caves day trip planning site . Traveling by car from Rotorua to Waitomo Caves takes 2 hours. Alternatively, you can take a bus. Finish your sightseeing early on the 30th (Thu) to allow enough time to drive to Whitianga. Whitianga is a town on the Coromandel Peninsula, in the Waikato Region of New Zealand's North Island. Take a break from the city and head to Opito Bay Beach and Whangamata Beach. Discover out-of-the-way places like Opoutere Surf Beach and Matarangi Beach. 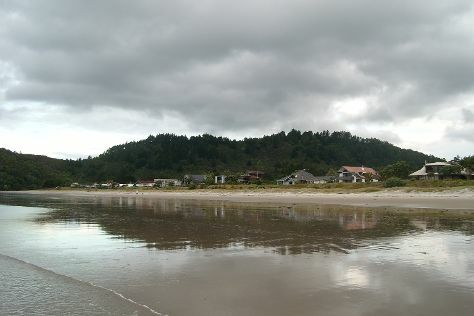 Venture out of the city with trips to Hot Water Beach (in Hot Water Beach), Hahei Beach Walk (in Hahei) and The Little Gallery (in Tairua). It doesn't end there: enjoy the sand and surf at Otama Beach and take in the natural beauty of The Lost Spring. To find reviews, traveler tips, more things to do, and tourist information, go to the Whitianga trip itinerary maker tool . Drive from Waitomo Caves to Whitianga in 3.5 hours. Alternatively, you can do a combination of train and flight; or take a bus. In January, plan for daily highs up to 26°C, and evening lows to 19°C. Cap off your sightseeing on the 2nd (Sun) early enough to travel to Kerikeri. Kerikeri, the largest town in Northland New Zealand, is a popular tourist destination about three hours drive north of Auckland, and 80 km north of the northern region's largest city, Whangarei. Kick off your visit on the 3rd (Mon): identify plant and animal life at Wildlife Areas, fly like a bird with a parasailing or paragliding tour, and then identify plant and animal life at Paihia Harbour. Keep things going the next day: surround yourself with nature on a nature and wildlife tour, then admire the natural beauty at Waitangi Treaty Grounds, then trek along Kororipo Pa Historic Walk, and finally admire the sheer force of Rainbow Falls. To find reviews, more things to do, other places to visit, and other tourist information, go to the Kerikeri trip builder website . Getting from Whitianga to Kerikeri by combination of shuttle and flight takes about 5 hours. Other options: drive; or take a bus. Cap off your sightseeing on the 4th (Tue) early enough to travel to Dunedin. With its history proudly stemming from the Scottish settlers who came here during the colonial era, Dunedin's streets are lined with well-preserved examples of Victorian and Edwardian architecture, while a new culture of nightlife and fine dining takes hold around them. On the 5th (Wed), tour the pleasant surroundings at Tunnel Beach Track, then sample the tasty concoctions at Speight’s Brewery, then contemplate the long history of Olveston Historic Home, and finally see the sky in a new way at Otago Museum. To find other places to visit, reviews, and other tourist information, refer to the Dunedin road trip website . You can fly from Kerikeri to Dunedin in 5.5 hours. Alternatively, you can do a combination of flight and bus; or do a combination of bus, car, and ferry. Finish up your sightseeing early on the 5th (Wed) so you can travel back home.